PPSC Livestock and Dairy Development Department Punjab jobs are available in the Veterinary sector 2017. These jobs are available for capable candidates. The eligibility criteria is mentioned below along with details that will help you if you are interested in applying for PPSC Livestock and Dairy Development Department Punjab jobs 2017. The registration is done online. Masters degree in Business Administration or Policy Studies or Economics or Development with a Basic Degree of Veterinary Sciences. All the interested candidates are required to submit their application forms online. The registration process is to be completed online. Candidates can edit their information on the application form before the closing date. Punjab Public Service Commission Livestock and Dairy Development Veterinary Officer Jobs in 2017. 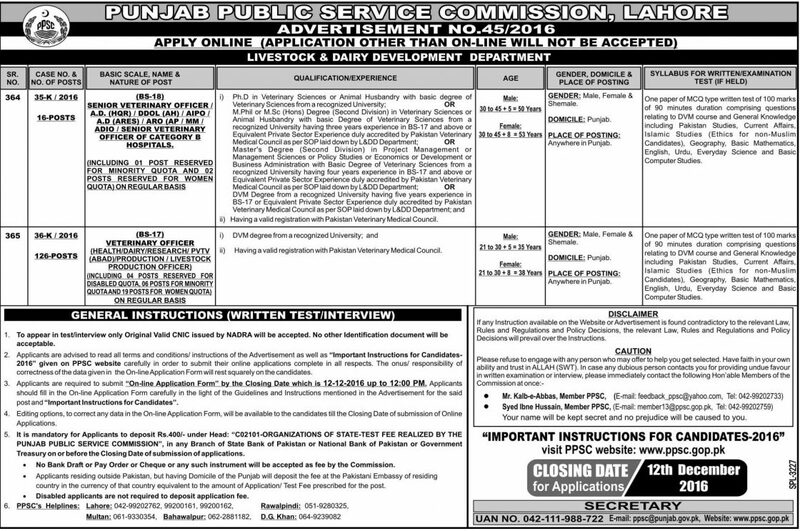 Punjab Public Service Commission Livestock and Dairy Development Veterinary Officer Jobs in 2017. The eligibility criteria for the respective posts is available on the page.